Few people have hearts more set on pilgrimage than Rev. Andrew Cammenga and his wife, Millie. When he retired from the regular duties of pastoral ministry eleven years ago, the couple climbed into their motor home and embarked on their uniquely mobile ministry. In those eleven years, they have served eleven congregations, starting church plants and filling vacant pulpits. In the process, they have jumpstarted corporate spirituality and filled individual hearts. 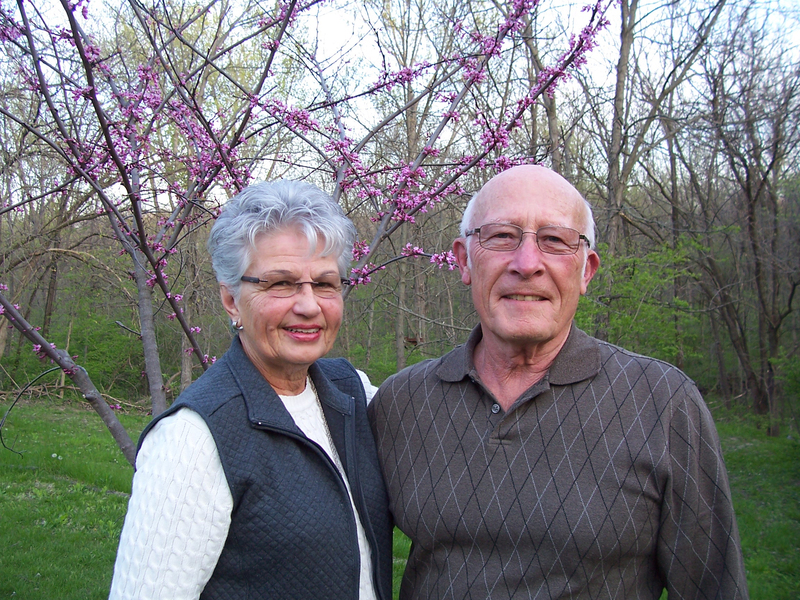 Christian Renewal caught up with the Cammengas in Pella, IA, shortly after they marked on May 1 their 54th wedding anniversary and the 11th anniversary of Rev. Cammenga’s retirement. CR: Rev. Cammenga, you and Millie were living Holland, MI, where you had a successful career selling business forms throughout the western part of the state. What led you to consider the pastoral ministry? AC: For a couple of years I had been feeling that call, but I first thought that was nuts. I told myself, “I can serve God better as a good salesman than a poor preacher.” We had two children; I had a good job; it seemed like rather an insane call since I didn’t have college. I thought about taking a couple of courses at a junior college, which never quite worked out, and I couldn’t get rid of the sense of that call. Finally, as a last resort, I thought my wife would help me nix this foolish idea. Millie and I were camping and the kids were in the tent sleeping. I finally confessed to her what I’d been struggling with, thinking she’d just kind of laugh and say, “That’s really funny,” but she didn’t. She said, “Well, if that’s how you feel, we should pursue it and see where the Lord leads.” Two days later I was going into the Grand Rapids high school getting my grade reports and trucking over to Calvin College to register late for two courses, Latin and English. At that time, Calvin was one of my customers, so it worked out pretty well for me to attend those classes while I was in the Grand Rapids area. We didn’t tell anybody about it because I first had to see whether I could really cut the mustard. Then Millie was at a cousins’ party one day and one of her cousins said, “I saw Andy at Calvin.” Millie said, “That’s one of his customers.” But her cousin replied, “No, he had books under his arm.” Millie admitted I was taking a couple of classes, so we thought we better tell both sets of parents about it. CR: How long did you continue working full-time and attending school part-time? AC: I tried to work with my company to get a special compensation package and work on a part-time basis, but they wouldn’t go along with that. They would only agree to give me a leave of absence and take me back if things didn’t work out. So we sold the house in Holland and moved to Grand Rapids. I quit my job and enrolled full-time at Calvin College in January. CR: How did that go for you? From that time on, it was a go; although the call was always tentative, the grades came. I did all my college in three and a half years. We had two children when I started and four when I finished seminary seven years later. CR: After you graduated from Calvin College, you attended Calvin Seminary and graduated in 1970. You served CRC congregations in Brookfield, WI (1970); Lynden, WA (1976); Escondido, CA (1985), which became United Reformed in 1997, before you retired on May 1 of 2000. You and Millie bought your motor home a couple of months before your retirement and held repeated garage sales to get rid of most of your household possessions. Didn’t you do quite a bit of traveling that first year? AC: Yes, that first year we crewed a private boat on the inside passage to Alaska for six weeks. After that we went from northwest Washington to Nova Scotia, to Key West, to southern Texas, to San Diego. Along the way we spent some time with our children in Michigan and Arizona. We are very thankful for the good health the Lord has given us and praise him for making this kind of retirement possible. CR: What churches have you served during your retirement? AC: We spent a couple of months at an attempted church plant by Chino URC in Mt. Terrace, near Redlands, CA. They had started that church plant and wanted to know if it was viable. After the group lost a few core families because they moved away, we recommended that they close it. We were close enough to Chino that the three or four remaining families could just as well go to Chino, which they did. Then we served about three months at a church plant in central California, Lemoore (which later moved to Hanford). We were in Calgary for at least two months, over the Christmas holidays, while that URC was vacant. Then we were in Belgrade, MT, for a few months during the winter. We helped start the church plants in Rock Valley and Sioux Center, IA, and we served Redeemer in Orange City, IA, while it was vacant. We served at First URC in Chino URC for four or five months. And we were in Kansas City while that church was vacant, then in Bellingham (which is still vacant), and then to Covenant Reformed Church in Pella. We spent more time in Chino because Rev. Ronald Scheuers was on a writing sabbatical, working on the “Life in Christ” catechism curriculum. Incidentally, I wrote Facing Faith’s Challenges: Defending the Faith and Answering Life’s Important Questions, which is one of the higher level volumes in that curriculum. We are often asked to serve somewhere in the winter, when seminarians are not available as they are for summer assignments. We avoid living in our motor home during winters in the Midwest. But while we were in Sioux Center and Orange City, we lived in it. We came there in April and they told us it would be spring, but actually it was snowing! CR: How do you manage the logistics of your nomadic lifestyle? How do you handle mail and where is your home base? AC: We have a mail service in Montana that receives our mail and sends it to us when we ask for it. If we’re traveling, we look ahead to where we’re going to be and find a small town where we have our mail sent to general delivery, and then we pick it up there. Our church membership is still in Escondido URC. If we are available, we spend the winter about 50 miles southeast of San Diego, working at a Bible camp. I do manual work, light construction and repair, that kind of stuff, while Millie does some sewing and cleaning for the camp. CR: What’s the story on your boat? I understand that you built it yourself. When did you build it, where is it stored, and how often do you get out on it? AC: The boat is called Persistence I. We had a contest for the congregation to name the boat and “Persistence” won. It’s in Washington, in a barn, waiting—eagerly waiting. It’s going out June 20 and I’ll be out on it almost every day, except Sunday, until October. It’s what I call my harbor ministry. It’s right on the border, so we get the crab in Canada and for the salmon we go on the west side of Vancouver Island. I was fishing a couple of years ago with my brother and a big gray whale surfaced between us and the shore, about 20 yards off our boat. My brother just about fainted. I could almost smell its breath. We’ve also been around them when they’ve breached and that’s exciting; we’re just glad they don’t breach on top of you! When we moved to Escondido from Lynden, my back was giving me problems and golfing was getting awfully expensive, so I decided to do something cheap: I’d build a boat. So it was a project in lieu of golfing. I worked on it every Monday for five years. It was totally absorbing; on Monday I didn’t think of anything else. It was a very therapeutic. It was the only project I ever had that I didn’t have a deadline. The fun was in the building of it, although it was an enormous challenge because nothing is straight on a boat. The one thing that most concerned me almost from the get-go was how I was going to drill a shaft hole through the keel. The next Saturday he was over at my garage and checking out the PVC pipe I had sticking out where I was going to put the keel. He took some measurements and did a few other things and a week or so later he came back with a jig. The keel was laid up one board at a time, so every time I put on a board, I would first drill it with the exact angle using the jig he built; then I’d slip the board over the PVC pipe and kept going that way until I had that keel built all the way up. He took an interest and he was a perfectionist. He didn’t think my keel bearing and some other manufactured items were true enough, so he took them to the shop from time to time and trued them up. And then finally we started talking about Jesus. I catechized him and baptized him about a year later. CR: What’s your take on the URCNA federation by this time? What things disappoint you and what things encourage you about it? AC: The thing that most disappoints me about the URCNA is its congregationalism, particularly with regard to mission work. It’s almost impossible for individual congregations to do a good job of foreign missions. I sometimes wonder if we should tag on to the OPC or the PCA mission efforts since they have well-established denominational programs in place. The thing that most encourages me is that wherever we go we see congregations that are full of young families. That life and vitality leads us to believe that the URCNA has a bright and vibrant future. The above interview by Glenda Mathes appeared in the June 8, 2011, issue of Christian Renewal.